Revington TR and the TR Register’s Spares Development Fund (SDF) are pleased to announce the re-introduction of these lamps, which were first displayed in the arena and then on the Revington TR stand at the International Weekend at Malvern 2010. The aim of the project has been to recreate the lamps as near as practically possible to the original product. We are pleased to say that this goal has not only been achieved but we believe exceeded. In an effort to ensure the quality of the product would be up to scratch, we started by commissioning the main body, as we knew this would potentially be a showstopper. After protracted development, the first and then the second prospective manufacturers were sacked! The third insisted on a 3D model and the production of plastic prototypes to prove the drawing, before launching tooling. The tooling was signed-off early in 2010 after very careful scrutiny to ensure the metal thickness was correct and general form matched the samples. As a result, the final die-casting is virtually indistinguishable from the original part - apart from a lack of pitting! Typical features which have been carefully reproduced are: the bull nose ends to the flutes and the curvature of the body where it sits against the wing. This has been checked against original parts on new, unused, Stanpart wings. 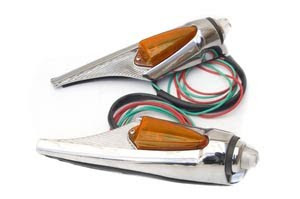 All gaskets bulb holders and lenses are to original shape and form, thus ensuring that all new parts are interchangeable with original parts, even down to the type of bulbs used. The photograph shows the first pair off the tools. Note that, as shown here, the amber lens does not have its lettering, but this has been added on production parts. All the parts have original markings - this is permitted as we have authority, for a fee, from the holder of the Lucas trademark.